Hi everyone! As I promised, I decided to upload my review on Lancome's Tonique Comfort Rehydrating Comforting Toner for Dry Skin. Before I begin, here's some info about the toners that I've been using prior to purchasing Lancome. I've been using two types of toners from two different brands: LANEIGE's Power Essential Skin Refiner Sensitive (toner for sensitive skin) and Biotherm's Biosource Hydra-Mineral Lotion (toner for combination skin). However, I was really disappointed with both and thought it was the time to move on. 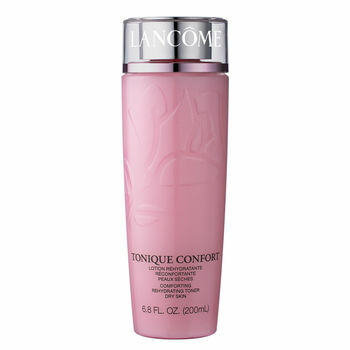 So I planned on seeking for toners from other brands and thought of giving Lancome a try at Duty-Free D: (Yepppppppie!). The bottle has a beautiful rose-shaped pattern that is uniquely for Lancome. The scent is flowery but it is really hard to explain exactly what it smells like. However, the scent is not irritating but fresh and gentle. Other than the scent, my first impression was that it is too thick to call it toner but it is also too diluted to call it lotion. But whatever it is, it definitely does its job to hydrate your skin. It does not absorb into your skin right away but stays on your skin until your skin feels moisturized (If you are into quickly-absorbed toners, you will not be a huge of fan of this). Then, once the surface of your skin is hydrated, it works its way in and keeps it soft and fresh. I've been saying in every post that my skin is very dry that it reaches to the point where it feels like it is torn apart if not moisturized with my standardized skincare routine (Toner--> Lotion-->Aquasource Deep Hydration Replenishing Gel-->Source Therapie 7 serum). It sometimes feels tight even when these steps are followed. However, I managed not to go through these steps with Tonique Comfort. After a week, the softness of my skin, along with the size of the visible pores, has improved. I'm only using Tonique Comfort and Source Therapy 7 Skin Perfection Catalyzing Serum right now and it feels soooooooo much smoother without the crazy steps (besides, I forgot to pack Deep Hydration Replenishing Gel on my way to Korea............OMG I can't wait to try it with Tonique Comfort). I'll still try other toners from different brands to find the best toner on Earth, but until then, Lancome's Tonique Comfort will be my holy grail. If you have any question about this product, please leave a comment below or subscribe for more information!